Going deep. Round-the-clock deep wrinkle defense. This hard-working wrinkle remedy continues the wrinkle reversal while you sleep, making the most of overnight repair by intensifying the skin-plumping benefits of your Fillerina® Plus Replenishing Treatment. 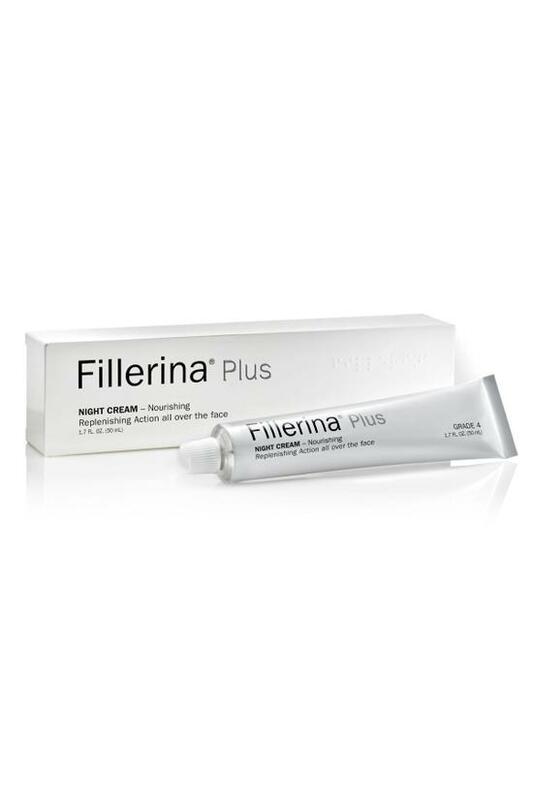 · Night Cream and Fillerina® Plus Day Cream (08509) are great solo anti-agers, but deliver even more powerful hyaluronic acid building and plumping when used following the completion of the more-intensive Fillerina® Plus Replenishing Treatment (08511) 2-week regimen. Use nightly on clean skin. Warm up a dime size between the palms and pat/ rub into the face and neck. Aqua, Dimethicone, Diisopropyl Dimer Dilinoleate, Hydrogenated Polydecene, Isostearyl Isosterate, Triticum Vulgare Germ Oil, Butyrospermum Parkii Butter, Glycerin, Betaine, Cetearyl Alcohol, Glyceryl Stearate, Sodium Lauroyl Glutamate, Stearic Acid, Phenoxyethanol, Acrylates/C10-30 Alkyl Acrylate Crosspolymer, Prunus Amygdalus Dulcis Oil, Rosa Moschata Seed Oil, Tocopheryl Acetate, Xanthan Gum, Parfum, Diazolidinyl Urea, Sodium Hyaluronate, Hydrolyzed Glycosaminoglycans, Triethanolamine, Methylparaben, Disodium EDTA, Potassium Chloride, Limonene, Ethylparaben, Cyathea Cumingii Leaf Extract, Linalool, Butylene Glycol, Pseudoalteromonas Ferment Extract, Sodium Hyaluronate Crosspolymer, Hexyl Cinnamal, Retinyl Palmitate, Hydrolyzed Hyaluronic Acid, Butylphenyl Methylpropional, Geraniol, Citronellol, Hyaluronic Acid, Coumarin, Hydroxypropyl Cyclodextrin, Hydrolyzed Sodium Hyaluronate, Citral, Pentylene Glycol, Caprylyl Glycol, Arginine, Salicylic Acid, Sodium Hydroxide, Ethylhexylglycerin, Acetyl Hexapeptide-30, Palmitoyl Tripeptide-38, Acetyl Hexapeptide-37. Winner of a NewBeauty® Beauty Choice Award. The first of its kind for home use, Fillerina's signature dermo-cosmetic gel rivals doctor's office injectibles for replenishing lost Hyaluronic Acid (what gives skin its youthful plumpness). Needle-free, their 2-week treatment beautifully fills wrinkles, firms, contours and restores diminished volume in eyes, cheeks and lips for smoother, thicker skin. fillerinausa's expanded line of luxury treatments and creams boost the benefits to give lasting results for up to four months.